Spinopilar moria, copyright BioEspeleo Consultoria Ambiental. The Tricommatidae are a group of small short-legged harvestmen found in southern Brazil and Paraguay. The group is characterised by an elongate coxa II which widely surpasses coxa III in ventral view (Kury 2002). [K02] Kury, A. B. 2002. 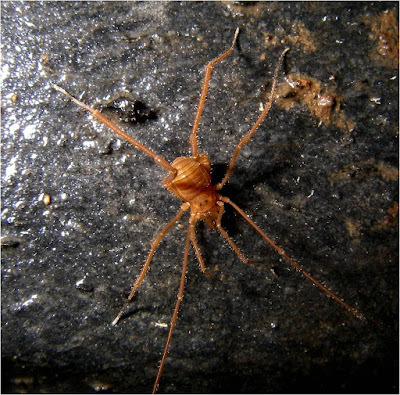 A new genus of Tricommatinae from eastern Brazil (Opiliones Laniatores Gonyleptidae). Tropical Zoology 15: 209–218. [K06] Kury, A. B. 2006. A new Tricommatinae from the montane savanna of São Paulo (Opiliones: Laniatores: Gonyleptidae). Zootaxa 1325: 211–217. [KP-G08] Kury, A. B., & A. Pérez-González. 2008. The first cave-dwelling Spinopilar Mello-Leitão 1940 (Opiliones Gonyleptidae Tricommatinae), described from a Brazilian cave. Tropical Zoology 21: 259–267. [OK06] Özdikmen, H., & A. B. Kury. 2006. Three homonymous generic names in Araneae and Opiliones. Journal of Arachnology 34 (1): 279–280.